UNITED NATIONS – Russia and China on Thursday vetoed a U.N. Security Council resolution referring the Syrian crisis to the International Criminal Court for investigation of possible war crimes, prompting angry responses from the proposal's supporters who said the two countries should be ashamed. More than 60 countries signed on to support the French-drafted measure, in a dramatic demonstration of international backing for justice in the conflict which has sent millions fleeing and killed more than 160,000, according to activists. 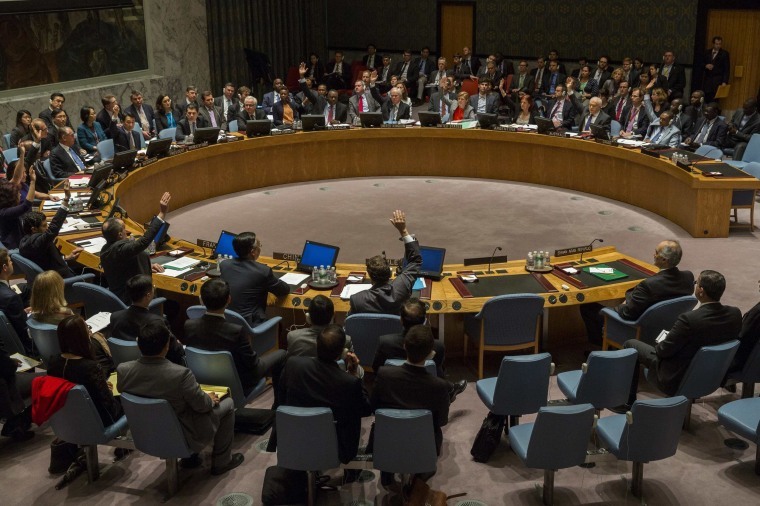 The resolution would have referred Syria's crisis, now in its fourth year, to the world's permanent war crimes tribunal for investigation of possible war crimes and crimes against humanity, without specifically targeting either the government or the opposition. Today was about accountability for crimes so deadly they have few equals in modern history—but also abt accountability for members of #UNSC. Before the vote, U.N. Deputy Secretary-General Jan Eliasson pleaded with council members to find unity and "put an end to this long nightmare," saying the council's credibility was at stake. French Ambassador Gerard Araud warned, "A veto would cover up all crimes. It would be vetoing justice." But Russian Ambassador Vitaly Churkin walked into the council meeting with a smile, telling reporters, "I'm going to be boringly predictable." Churkin, who had called the vote a French "publicity stunt" that would hurt efforts to find a political solution to a crisis, lashed out at France again on Thursday. He asked why France was damaging the unity of the five veto-wielding permanent members, who had agreed on earlier resolutions to eliminate Syria's chemical weapons and on improving delivery of humanitarian aid. China's deputy U.N. ambassador Wang Min echoed Churkin, adding that a referral to the ICC won't lead to an early resumption of peace talks. U.S. Ambassador Samantha Power had her speech ready for the promised veto. "Sadly, because of the decision by the Russian Federation to back the Syrian regime no matter what it does, the Syrian people will not see justice today," she said. Syria is not a party to the Rome Statute that established the International Criminal Court, so the only way it can be referred to The Hague, Netherlands-based tribunal is by the Security Council.